Do closer Tokyo-New Delhi relations meet their domestic needs or target China? Japanese Foreign Minister Taro Kono met his Indian counterpart Sushma Swaraj at the Ninth Japan-India Strategic Dialogue in Tokyo on March 29. The two sides reached consensus on strengthening economic ties and advancing cooperation on maritime security. Japan will lend India 149.2 billion yen ($1.4 billion) for projects including a subway in Mumbai. Tokyo extended more than 384.1 billion yen to New Delhi in fiscal 2017, the highest amount to a single country in history. The two countries have also seen intense collaboration in maritime security. The strategic dialogue epitomizes closer Tokyo-New Delhi ties and has laid the basis for the India-Japan summit to be held later this year. 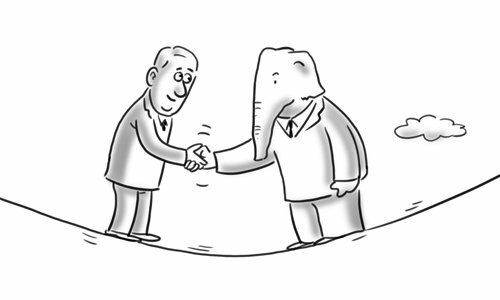 In recent years the two countries have seen enhanced cooperation at diverse levels. Swaraj said that under the leadership of Prime Minister Narendra Modi and Japanese Prime Minister Shinzo Abe, "India-Japan relations are stronger than before." Closer India-Japan relations have triggered widespread speculation: Are they the result of meeting domestic needs or targeted at a third party? From the Indian perspective, strengthening ties with Japan is driven by political, economic, military and diplomatic considerations. Politically, India has long regarded the Indian Ocean as its backyard. In the past, the country neither allowed other players to intervene in the Indian Ocean nor involved itself in other oceans' affairs. But with its rise, India has started to advocate the Indo-Pacific strategy and Japan, given its status and role in the Asia-Pacific region, is also an important part of this strategy. Economically, Modi promoted Make in India and Digital India programs that involve domestic infrastructure construction, enhanced manufacturing and a boost for an economic take-off. This requires tremendous foreign investment. As one of the world's largest foreign investors, Japan is well-capitalized and its assistance is important for Modi to realize his Indian dream. Militarily, a strong military force is the basis for New Delhi to reach out to the Pacific Ocean. Japan's advanced weaponry and military technologies are what India has been relentlessly pursuing. Strengthened ties with Tokyo are an important way for New Delhi to acquire weapons and advanced military technologies. Diplomatically, Tokyo has common interests with New Delhi in UN reforms. Japan is an important supportive force for India's bid for the Nuclear Suppliers Group. From the Japanese perspective, the country has attached great importance to strategic cooperation in strengthening ties with India. Japan put forward the Free and Open Indo-Pacific Strategy in 2016, the essence of which is improving Japan's influence in the Indo-Pacific region and facilitating its bid for a permanent seat at the UN Security Council while realizing its dream of becoming a political power. India is an important country in the Indo-Pacific region, and closer ties with India may help Japan realize its dreams. In the press conference after the strategic dialogue, Kono stressed India was Japan's most important partner in its Free and Open Indo-Pacific Strategy. Intensified Tokyo-New Delhi relations have an increasingly apparent tendency to target China. The two countries put forward the Asia-Africa Growth Corridor with the intention of containing Beijing's Belt and Road initiative. Japan's Free and Open Indo-Pacific Strategy is, to a large extent, confrontational against China. But India is more cautious on China-related issues in its collaborations with Japan. This is why Swaraj made no mention of Tokyo's much-stressed maritime security cooperation. Although the Japan-India relationship has reached its historic peak, the purposes and motives behind their bilateral collaborations mean that their cooperative relationship will be neither long-lasting nor stable. Tokyo-New Delhi cooperation, with a weak foundation, hasn't yielded the desired results so far, and the two countries will see their ties cool once cooperation delivers less than expected. Thus China should view and handle closer Japan-India relations with composure, and oppose any bilateral cooperation that targets a third party.